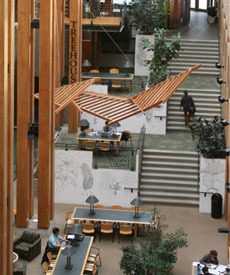 The Forest Sciences Centre was completed in 1998 and was designed to showcase construction using Canadian forest products. The 17,505-square-metre Forest Sciences complex has 11 classrooms, 2 lecture theatres, teaching laboratories, office space, computer labs, study areas, and a cafeteria and houses the Faculty’s three departments. Built along side the Forest Sciences Centre is the 3,730-square-metre Centre for Advanced Wood Processing. This building includes two 25-seat classrooms, a machine lab, a simulator lab and a computer lab.A fundraising campaign provided the opportunity to name rooms in the Forest Science Centre. The campaign was led by David McInnes, Chairman, Weyerhauser Canada Ltd and George Richards of Weldwood Canada Ltd. The Noranda Foundation and Noranda Forest Inc. Learn more about how wood is used in the Forest Sciences Centre, or the classroom facilities available. Emergency procedures for the Forest Science Centre building are documented in the Building Emergency Response Plan.